Hingham Apparel is available October through April, while supplies last, and every purchase benefits our PTO. See available items and sizes below, order online, and pay by PayPal. Alternatively, you can print an order form and send it via backpack or drop off at the front office. Note availability online when completing your form. Please makes checks payable to South School PTO. Put order form and check in an envelope marked PTO - South School Apparel. Please contact Kara Gannon with any questions at (781) 749-5296 or tkgannon@comcast.net. Medium and Large - show your school spirit! 12"H x 18"W x 6"D 2 left! 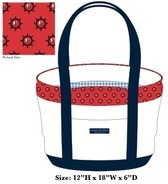 White canvas tote with red edging and red "Hingham."